A woman has died after being hit by four vehicles while using a pedestrian crossing in south London. 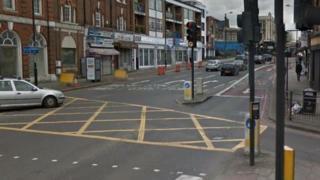 The woman, in her late 20s to early 30s, was struck by an HGV as she crossed Norwood Road in Tulse Hill at 06:48 GMT. She was then subsequently struck by a second lorry and two cars, a spokesperson for the Met Police said. None of the drivers stopped, the force added. The woman was pronounced dead at 07:21. Formal identification is yet to take place and inquiries to trace the victim's next of kin are ongoing. Acting Det Sgt Alastair Middleton said: "I am appealing for anyone who witnessed the collision and the moments afterwards to contact us. A post-mortem examination will be held in due to course.